We’ve covered some exemplary English dishes over the past few months but fish n’ chips really takes the cake in terms of being the most widely recognized. In the UK you can hardly walk a block without encountering a place that sells it. Plus, it’s common enough in Canada and the US to justify this post. Surely, such an iconic meal has an illustrious history, or an interesting one, anyway. Well…yeah, it does. There are a few different theories about when the recipe came to fruition, and where. Some assert that the first fish n’ chip shop was opened by a Jewish immigrant, Joseph Malin, in East London in 1860. Others suggest John Lees of Lancashire was responsible for popularizing it in 1863. Of course, this doesn’t even include how fish and chips as individual entities came to be. It turns out that the former was introduced to England by Western Sephardic Jews sometime in the 17th century. Chips, on the other hand, came into play two centuries later upon being described by Charles Dickens in A Tale of Two Cities. He characterizes, “Husky chips of potatoes, fried with some reluctant drops of oil,” which caught on in a snap. Honestly, who wouldn’t want to gobble those right up? The first sit-down fish n’ chips restaurant was run by English retailer Samuel Isaacs in the late 19th century. The establishment served this fine dish (and other quaint meals like bread and butter) in a country dominated by take-out joints. Unsurprisingly, the restaurant quickly became a chain. Fish n’ chips boosted British morale and reduced hunger during both World Wars. Unlike most other foods it wasn’t rationed due to its popularity and ability to keep people happy. If your country isn’t well fed it and in good spirits it won’t do so hot on the battle field, after all. In the late 20th century, fish n’ chips sales dwindled in certain areas due to reduced haddock and cod stocks and growing public concern over excessive fried food consumption. However, its popularity has been restored in recent times due to the fact that it isn’t as unhealthy as previously imagined. Fish n’ chips were served on newspapers until the 1980s? 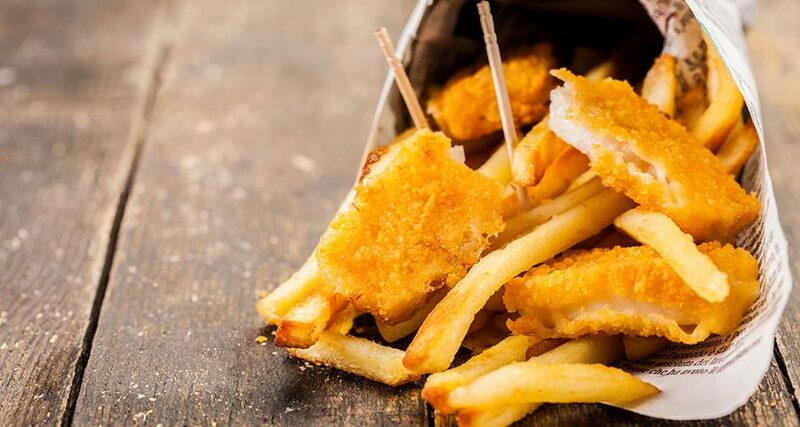 More than 250 million fish n’ chip dishes are sold in the UK each year? Musky peas are the most popular side order to the classic meal? Fish n’ chips are served with sugar in China? There’s less fat in an average portion of fish n’ chips than a tuna-mayo sandwich? Chips have twice as much fibre as a normal serving of brown rice? There are almost 10-times as many fish n’ chip shops in the UK as there are McDonalds (10,500 to 1,200)?